We’d love your help. Let us know what’s wrong with this preview of Good Things by Kevin Gerald. ● Recognize that Grace and Favor are so intertwined you can’t separate them. It’s time you move forward in confidence, knowing that God is for you. He is always seeking to give you good things, and His favor is forever! To ask other readers questions about Good Things, please sign up. One of my favorite quotes from the book is: "Hope is a stubborn, unrelenting determination to not allow the hardships of life to downsize the bigness of God." The author eloquently puts some of the questions he's wrestled with throughout his life on paper. He takes the reader along with him on a journey of choosing to believe that God is good no matter what and see God's goodness in our lives. I was introduced to new concepts like Theodicy, the Garden of God's grace, Plus Ultra, etc while also bei One of my favorite quotes from the book is: "Hope is a stubborn, unrelenting determination to not allow the hardships of life to downsize the bigness of God." I was introduced to new concepts like Theodicy, the Garden of God's grace, Plus Ultra, etc while also being challenged to see familiar concepts in a fresh way. Knowing the author personally, I appreciate that he lives out this message in his everyday life. It's not just a book for him, it's a real life application of biblical principles that he puts into practice daily. So often we ask the question, If God is so good, then why do bad things happen? In the middle of the disappointments and tragedies of life, is He really there? This book helps answer these questions and helps us realize that God is good, all the time and He desires Good Things for our life. 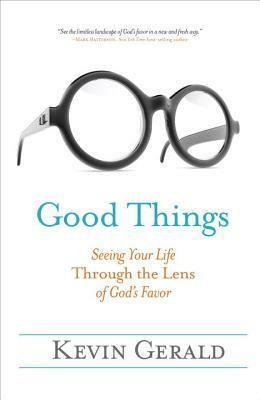 Good Things shows us how we can find the goodness of God in our everyday lives. It is one of those must read books. Get your spirits lifted and your hope renewed. God is good! Right from the start the author hits his reader with the question, “What do you think God thinks about you?” (10) Combine that with some polarized sunglasses and you are off and running through this book. This is a short, easy read that surveys seeing your life through the lens of God’s favor, borrowing his subtitle. I say survey since each of his chapters could have been a feature length presentation. Happily, he gives us enough to get the idea and go with it. You could almost say he’s an optom Right from the start the author hits his reader with the question, “What do you think God thinks about you?” (10) Combine that with some polarized sunglasses and you are off and running through this book. This is a short, easy read that surveys seeing your life through the lens of God’s favor, borrowing his subtitle. I say survey since each of his chapters could have been a feature length presentation. Happily, he gives us enough to get the idea and go with it. You could almost say he’s an optometrist of sorts, staying inside his metaphor. He’s out to help his reader see the good things more clearly. One statement in particular stood out for me. The authors says, “The actual challenge for us is not gaining God’s approval but rather accepting God’s approval.” (13) That’s just the starting point since favor in most of our minds involves approval. Gerald covers pessimism, optimism, Mondays and lots more. However, he does not allow the topic to descend into a matter of mere positive thinking. He’s too real and human for that one and knows we are too. He’s aware that life is tough, bad things happen, and evil exists. The vision correction he’s going for does not avoid the hard stuff and where the good things go in those really bad times. Lots to mull over in this 200 pages of book. It’s a starter book and one that could probably be read again in a while to look for the good things the reader can now see, and as reminder where to look for more. I received an advanced reading copy from the publisher in exchange for a review. Kevin Gerald begins with the premise that our attitude should be like wearing polarised sunglasses. What we choose to look at comes out in sharpest focus, whether we choose a positive or nega It's good to see a book about divine favour which focuses more on acknowledging and expressing thanks for what we've already got, rather than giving us tips to stir up more and more. I've read several of the latter sort over the years, and often what they stir up is a feeling of discontent and falling short. What some may interpret as redundancy in the book's illustrations, may also proof that one elects to see the bad in things as oppose to the good in things. The author intentionally uses the repetitive approach to help us retrain our mind through Pavlov's famous method of Classical Conditioning. In a similar manner, like when Pavlov trained his dogs to associate salivation when they saw his assistant, Gerald encourages us to salivate God's goodness regardless of what our physical eyes see. If one What some may interpret as redundancy in the book's illustrations, may also proof that one elects to see the bad in things as oppose to the good in things. The author intentionally uses the repetitive approach to help us retrain our mind through Pavlov's famous method of Classical Conditioning. In a similar manner, like when Pavlov trained his dogs to associate salivation when they saw his assistant, Gerald encourages us to salivate God's goodness regardless of what our physical eyes see. If one finds the book redundant, then they have missed the point as this book's mission is to retrain our way of seeing life. I recommend you read no more than one chapter a day so you can really retrain your mind and answer the question posed throughout, Why wait to accomplish the better you when the season in life is better? Overall, Gerald allows us to find the spiritual glasses to correct our spiritual myopia and realize that God's favor is always surrounding us as our lives ARE continuously falling into place. Expect good things. This book is so good in any season you are going through! Whether you feel like you're having a hard time seeing the good around you, or you just want to see more of Gods favor in your life, this book is for you! This is an amazing book about the goodness of our God. Loved it! Great reading! Easy to read, easy to remember and very challenging. Understanding God's favor as different than, but not separate from, His mercy was one of the treasures this book held for me! A tenacious fear of "prosperity gospel" has taught many of us to avoid, downplay, or misinterpret the Bible's teaching regarding God's favor. I found this book to hold much good Biblical counter-balance. If you have ever questioned Gods goodness....This book will have you seeing things very differently! Kevin Gerald will grab you and tell you the TRUTH about God and the Good Things that can be found in every situation! Love it! Seeing the goodness of God in our daily lives. So important to understand. What an incredibly life changing message. More of God's goodness and His message needs to be shared with everyone! Being a goodfinder is something anyone can do. This book teaches you how in simple steps and makes your life richer and full of joy. You can easily marinate in negativity...anyone can. What Pastor Kevin does is show us all how to see the good and know that God is good in all situations. It seems like every time I turn around the character and goodness of God is under attack. I always hear people say things like "If God is good then why is this bad thing happening?" Or "why is that happening..." or "why did this bad thing happen to me?" This book eliminates the "if" and can help to change our culture. We don't need more negative voices, we need more good finders that can find God in the middle of every good thing. Whether you believe in God or not, read this book!!! Incredible book about learning to see the goodness of God and His favor for our lives! "There's something that happens in our hearts and minds when we go from hearing that God is good to actually seeing God's goodness". This book was nothing short of amazing and life changing! I am a better person because of the Good Things book, and I am not able to see things through Gods favor that i might not have otherwise. I can honestly say that this book has changed my life for the better. It challenged the way I see the world and helped me see that despite difficult times I have so much to be thankful for. So excited to get this book in my hands. Kevin Gerald is an excellent communicator and is always so relevant. This is going to be my Christmas gift to all my friends and family! If you've ever wondered if God is good, this is the book for you! Kevin Gerald takes an honest look at a difficult subject and show us all how to see our lives through the lens of God's favor!